Non-toxic baby bath products. When choosing bathing-related products, it’s important to stick with organic and non-toxic options. Explore this non-toxic guide to bathing your baby, to find everything from baby bathtubs and shampoos to towels and bath rinsers. “Myth – The government prohibits the use of all dangerous chemicals in personal care products, and companies wouldn’t risk using them. Because our babies’ little bodies and system are not fully developed and can be extra sensitive, it’s important to select healthy, non-toxic products for bathing your baby, to limit exposure to harmful chemicals. Sadly, mainstream personal care products often are the biggest offenders when it comes to including harsh and harmful chemicals in their products – including baby and children’s products. No longer can we feel safe using mainstream brands like Johnson & Johnson or Aveeno Baby (owned by J&J). Johnson’s Baby Shampoo, for example, contains artificial food dyes, PEG-80 Sorbitan Laurate that can cause allergies or irritation, and highly irritating fragrances that receive a “High Hazard” rating from EWG’s Skin Deep Cosmetics Database. 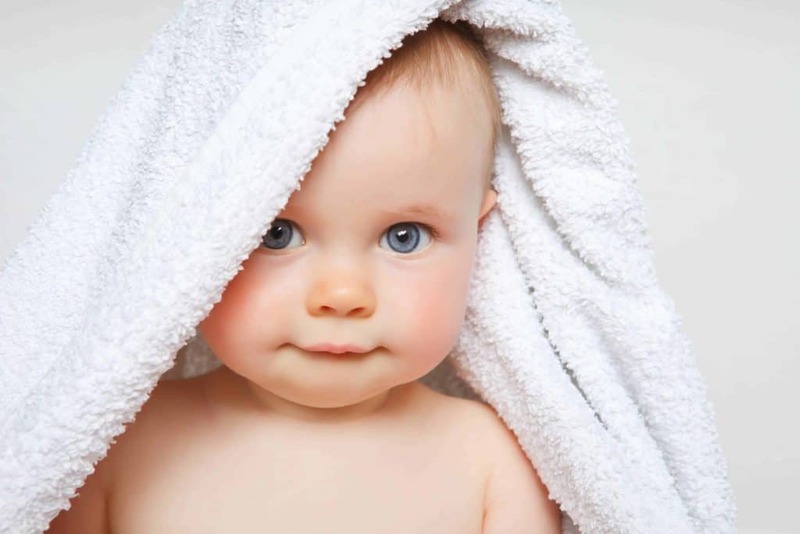 Newborns will get cold pretty quickly, so it’s recommended to place a small washcloth on their tummy that will absorb water and keep them warm while they’re in the bath. Fill the tub with a couple of inches of lukewarm water. ALWAYS check that it’s not too cold or hot for baby by placing your elbow in the water before placing them in the tub. Turn off the AC/heat (or close the vent in the bathroom) so that baby isn’t getting blasted with hot or cold air while in the bath. Choosing a natural and non-toxic baby shampoo and body wash for your little one is an absolute must, and the good news is that most of these products are relatively affordable. Thanks to the EWG Skin Deep database, we have great data to help us make healthy choices when it comes to baby shampoos and body washes. And with a newborn, you may not even need to use soap/shampoo at first – you can simply rinse them in the bath. 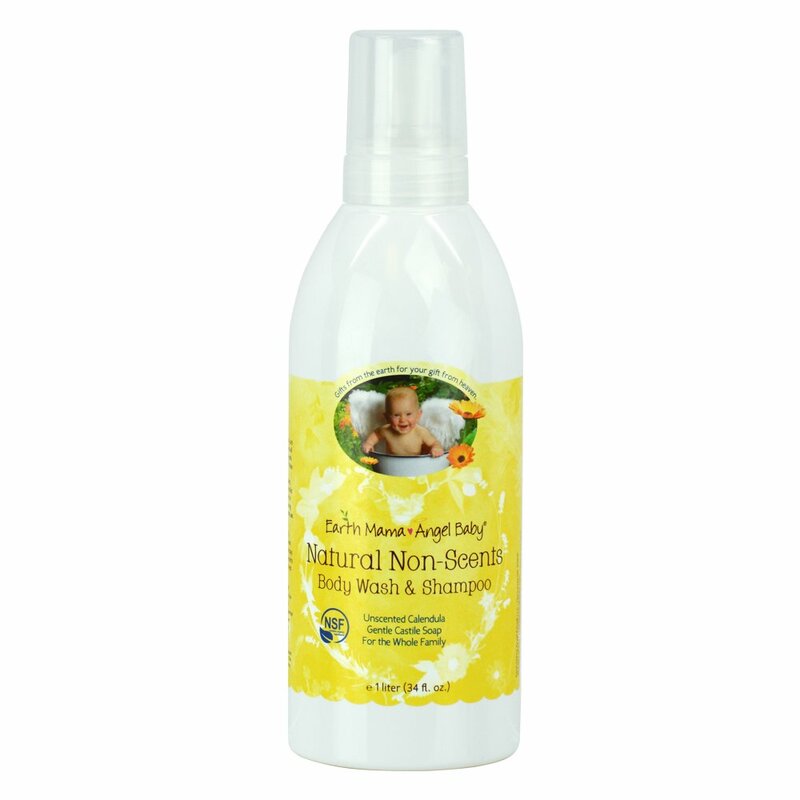 Earth Mama Angel Baby Non-Scents Shampoo & Body Wash (Unscented): This is the soap we have been using since the very beginning with our son. It is so pure and gentle that it’s suitable for babies with very sensitive skin – and even for baby’s very first bath in the hospital. I love this company and am so thankful for this product! It is a gentle castile-based soap made with organic calendula, and contains no fragrances, Triclosan, phthalates, parabens, petroleum products, dyes, or sulfates. It is such a natural formulation that it is also not tear-free, which means that you’ll need to be careful when using the product near baby’s eyes. Certified organic by Oregon Tilth, the Non-Scents shampoo is also vegan and gluten-free. They do offer a lavender body wash as well as an orange-scented wash, but I believe in going conservative on this and sticking with the unscented version. EWG Skin Deep Rating: 1 with no risks identified. Honest Company Shampoo + Body Wash: The Honest Co. makes a natural, hypoallergenic, tear-free shampoo and body wash that contains no sodium laurel sulfate, sulfates, parabens, synthetic fragrances, dyes, formaldehyde carriers, monoethanolamine (MEA), diethanolamine (DEA), triethanolamine (TEA), or common allergens. Many of its ingredients are organic. EWG’s Skin Deep Database has limited information available on this product, but in general a quick scan at the ingredients list yields relatively low ratings of 1-2. In general, it’s safest to use an unscented product; I even prefer to avoid products that are naturally scented, or scented with essential oils, because you just don’t know exactly how these unnecessary additives might affect your little one. EWG Skin Deep Rating: 1 with some concerns identified, including risk of irritation. In all honesty, I can’t recommend that you purchase baby lotion because babies simply don’t need any. If you feel that your little one’s skin is on the dry side, or could use a moisture boost, please only occasionally use a natural option such as this one. Also, please note that all newborns go through a period where their skin starts flaking off; this is completely normal, is not a sign of dryness, and does not need to be moisturized. 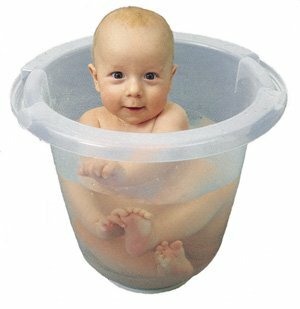 There are many great, non-toxic bathtubs available for bathing your baby, so the choice really comes down to space and personal preference. Primo EuroBath: This is the bathtub that I have used since my son’s very first bath, and I absolutely love it. It is made in the USA, and is free of BPA, lead, and phthalates. The tub can be used from ages 0-24 months, and has 2 bathing positions designed to keep baby from slipping into the bath water. For newborns and younger babies, I recommend laying down a towel beneath the baby to further prevent slipping and ensure their comfort. You’ll probably have the most success using this tub in an actual regular bathtub, although it could be used on the bathroom floor (but draining the tub would be difficult). Primo also makes the Primo Ducky Bath, specifically for babies age 0-9 months. 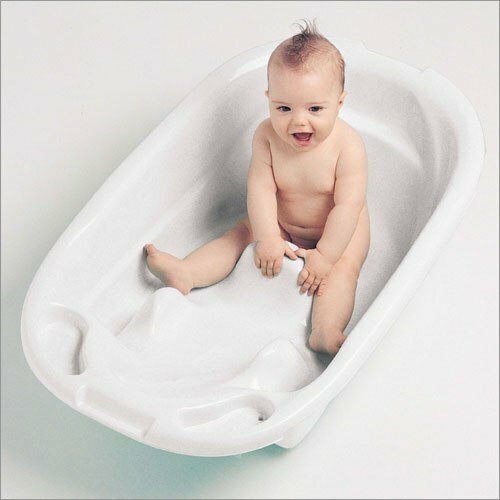 Puj Foldable Bath Tub: If you plan on bathing your baby in the sink, the Puj Tub is a great choice. It cradles baby to make them feel comfortable in the bath, is mold and mildew resistant, and BPA and PVC-free. It is designed to fit most sinks, including pedestal sinks. This is a good choice for c-section mamas. Stokke Flexi Bath: An alternative to the Primo Euro Bath, the Stokke Flexi Bath is a foldable baby bath that is lightweight and space-saving. The Flexi Bath is BPA-free, lead-free, phthalate-free, PVC-free, latex-free, formaldehyde-free, and heavy metal-free. The Original Tummy Tub: The Tummy Tub is an upright bathtub designed to be shaped like the womb and to provide similar comforts and confinement to your baby. It’s a great option for bathing your baby, and is made from food-grade Polypropylene, and does not contain any phthalates, BPA, lead, or other toxic elements. It can be used from birth to age 2 (up to 35 lbs.) and will fit in most kitchen sinks. Burt’s Bees Baby Towels & Washcloths: Burt’s Bees makes wonderful, organic towels for newborns that are GOTS-certified. 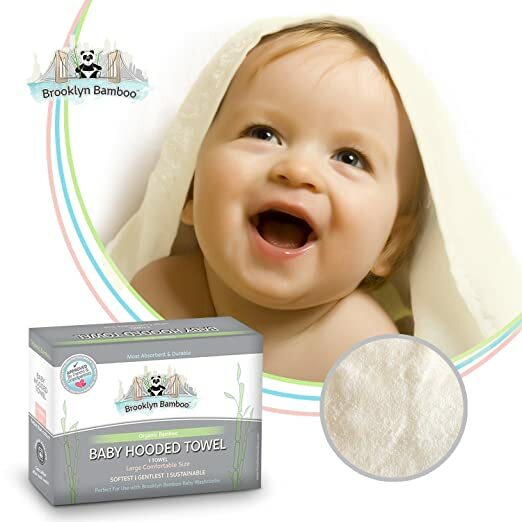 Brooklyn Bamboo Organic Baby Hooded Towel: Brooklyn Bamboo’s towels are so thick and soft – we just love them! Unfortunately, they’re made in China, but we are currently still using these towels until we find a better alternative. Bamboo Baby Washcloths: Certified by Oeko-Tex, Bamboo Baby’s washcloths are organic, dye-free, and made from bamboo. 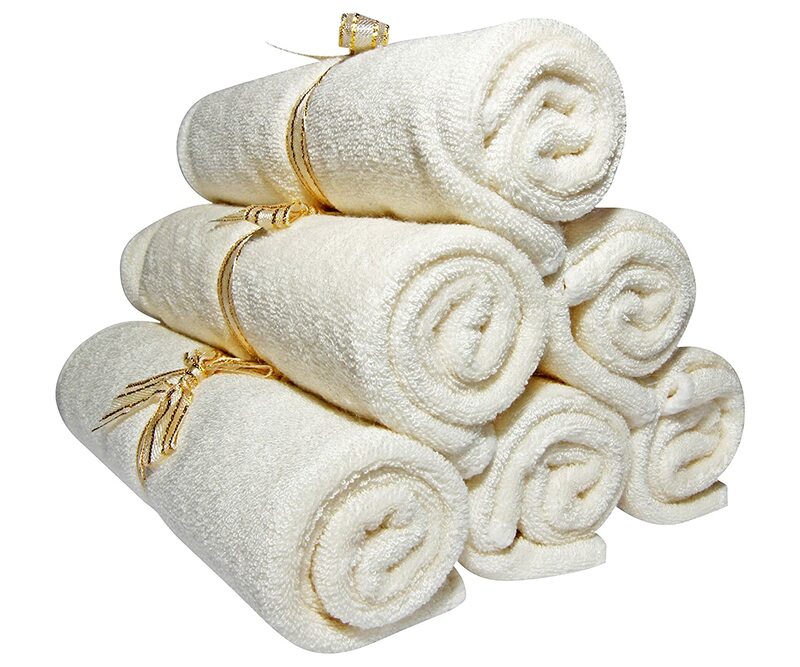 Soft and plush, these washcloths are top-notch. Again, my only gripe is that they are manufactured in China. 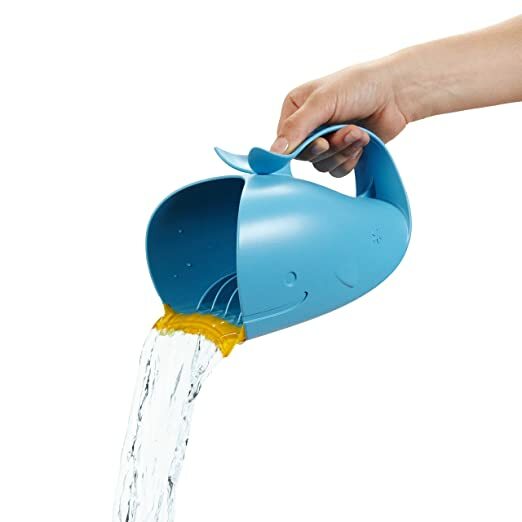 Skip Hop Moby Waterfall Bath Rinser Cup: This is the best rinser that I’ve come across. It’s made by Skip Hop and is free of BPA, phthalates, and PVC. It’s sturdier than some of the other rinsers available on the market (specifically the Munchkin brand rinsers). Perhaps one of the best features is that it stands up when not being used. I’ve even thrown this into the dishwasher every now and then. Skip Hop Moby Bath Kneeler: This isn’t an essential item, but many moms do like using this to protect their knees while giving baby a bath. We have a bathmat that I use instead of this. It is BPA- and phthalate-free. Rubber Duckie: This is actually a rubber duckie made from natural rubber, and not plastic/PVC, so it doesn’t contain the dangerous chemicals you’ll find in the plastic versions. It contains no BPA and no phthalates. The only downside is that this does contain a spout so it will allow water to get inside (why do companies do this!?). If you’d like to, you could always fill that hole with a hot glue gun (be careful around baby, of course). There’s a little friend for the duckie too, a blue rubber whale. The whale is sealed, meaning it won’t accumulate mold and bacteria inside. Hevea Bath Mat: Once your baby graduates from their baby bath tub, you may want to start bathing them in a regular bath tub. To prevent slipping, you’ll want to use a bath mat. Most bath mats are made from toxic materials, but the Hevea Bath Mat is made from 100% natural rubber. It works well and we love ours! It’s a great find. Hello! I just received my Primo EuroBath and am wondering….is it PVC free? The insert/packaging it came with says Phthalate free and BPA free, and Lead free but doesn’t mention PVC as it does on the internet description. Is it common for manufacturers to do that: list certain qualities in one place and not the other? It’s certainly possible. The more I learn about manufacturing, the less I trust what companies “say”. I’ll follow up. Thanks! Also, the manufacturer’s note on amazon states that the tub is made of polypropylene and is recyclable, but the tub I received doesn’t have a recycle code or symbol on it. Is it really recyclable? Don’t recyclable items have to have a code on it? Keeping your baby clean is really important. what are your thoughts on dr bronners unscented baby wash? i have used dr bronners for a long time and i love their company. just not sure if it is best for babies! It’s great and I definitely recommend it. I will be adding it to my list in an upcoming update. What are your thoughts on Burt’s Bees Baby products like their shampoos and lotions? Not a fan. Their products are ok but there are better alternatives. Their EWG ratings aren’t great. Lots of greenwashing. And the company was just purchased by Clorox, so it’s possible some ingredient substitutions will be made. I like Earth Mama a lot. Is that an option for you? Yes! Thanks for our reply. 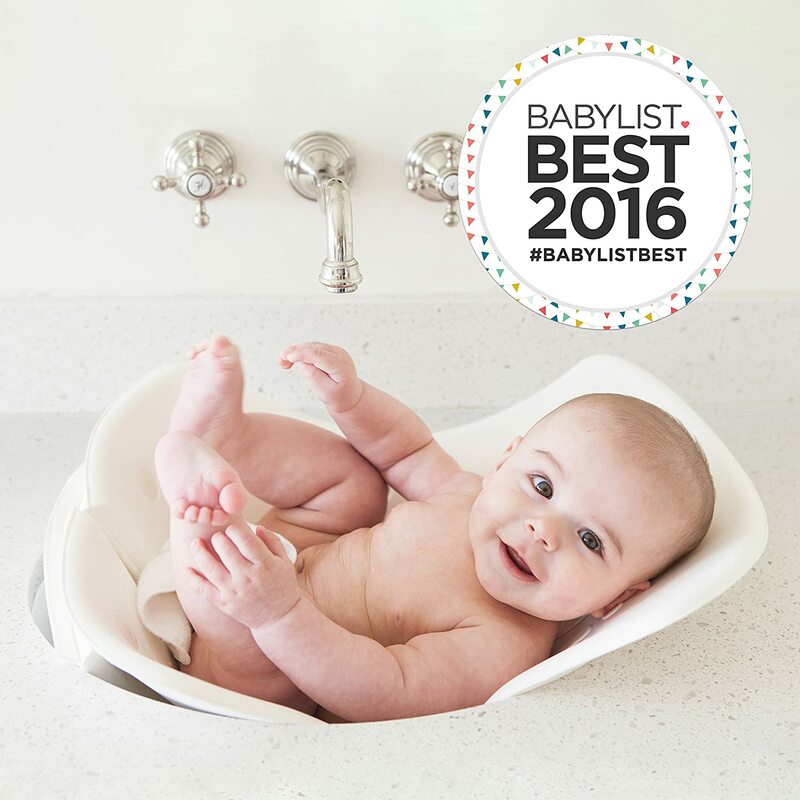 Is the Skip Hop Moby Smart Sling 3-Stage Baby Bath Tub BPA-free, PVC-free, and phthalates-free? Their website only states that it is free of PVS and phthalates; however, in response to a customer question on their website the company replied that it is also BPA free. Confused why their website does not state it is BPA free. Do you think it is BPA-free, PVC-free, and phthalates-free? (You recommend their other products so I am hoping for the best). Thank you. I like Skip Hop but not their bathtub. I do not see any official claims that it is BPA-free (only free of pac and phthalates) but it looks like customer service confirms it is BPA-free. Also, the sling is made from polyester and I believe it contains foam. If you can avoid this and use a different bathtub, I would recommend the Primo Euro Bath (though note it is quite large). Would you recommend the smaller version of Primo Euro Bath (called the Primo Ducky Bath)? Yes but it won’t last you as long as the original (if you plan to keep using a tub past the infant stage). It’s for 0-9 months. It’s also a bit limited in availability. Check Jet.com for what seems to be the best price. Can you recommend a non-toxic baby soap that is tearless? Look into Honest Company or Andy Pandy (though I’m not 100% sure if AP is tear-free, it is very gentle). https://andypandykids.com/products/100-natural-organic-baby-body-wash-shampoo. Use my discount code for 10% off: TGN10.